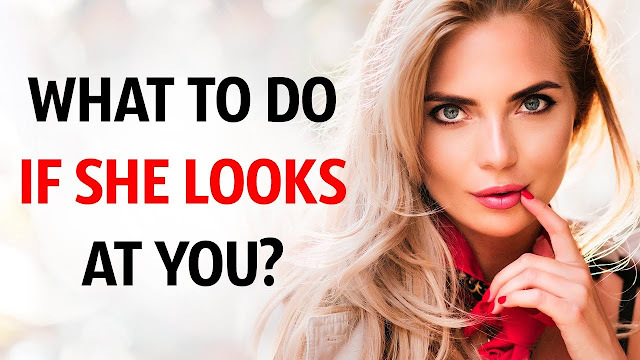 What to do when a girl looks at you? Are you a confident and brave spirit online but shy away and lose the whole act when a girl throws just one glance at you in real life? Yeah happens to the best of us. Well, it's easier to win in any game when you know the rules right? The same goes for flirting. So, to up your dating game and never lose your cool again when a girl looks your way. Pay close attention to the tips we're about to share with you. Let's see what we can do for your flirting game. That girl definitely knows what she wants. You look at her for like a millisecond and then immediately look away as your face is turning red. She totally caught you off guard. A minute later you calm yourself down and get ready for it but she isn't looking at you anymore. Congrats! you blew it. That's not what we want right! So, let's play that scenario again with some alternative approaches. You could order her a drink and have the waiter deliver a tour, saying compliments from the gentleman over there. Well, that trick might work in the movies but that's not how we do it in real life. If you want to buy the girl a drink, buy her a drink and give it to her yourself. Another thing dating coaches recommend for some reason is to get all mysterious and move to the other corner of the bar. The fair lady is supposed to follow you there and start a conversation herself. Word of the wise, that does not happen. It just creeps most women out and they'll find someone else to check out. So, what's the right way to do it? Just follow these basic steps. You won't have much time for this step but it's easier done than said really. You see the girl might have looked at you just because it's natural for people to scan the room with their eyes. She could just be deep in thought and giving you an empty look. Finally, it may be a former classmate or co-worker you haven't seen in ages, who's trying to figure out where she's seen you before. One thing is definite when she gives you the look, you'll know it, you'll feel right away that she set her eyes on you because you've beaten her interest. Some good signs that she's showing interest in you or when she shifts her gaze from you to some object and then back at you. When she maintains eye contact for longer than a second and obviously when she smiles while looking at you. If any of these signs are present it's up to you to decide whether or not to give her a meaningful look back which brings us to our next step. #2 Look back at her. If you feel she's into you and you're equally into her and you're not in a relationship at the moment, of course, it's high time you looked back at her. Seriously, don't hesitate to do it quickly or else she might think you're not interested. Let her know you've noticed her glance and you wouldn't mind getting to know her. When I say glance I really mean it, don't make it longer than one to two seconds. Staring at a stranger no matter how attractive they are would creep anyone out. In case, she looks away before she catches your glance, keep looking at her until she notices and forget about the cliche of smiling because it's a great icebreaker and so on. A grin out of nowhere, especially when it's nervous and paired with scared eyes or a cheesy smirk are unlikely to do you any good. Instead, practice something else, that works all the time. Supermodel and businesswoman Tyra Banks calls it a "smize" which translates to smile with your eyes. You can practice it in front of the mirror to master it so it doesn't come out all awkward when it's Showtime. A self-confident guy who knows his own worth can easily send a lady all the right vibes with his eyes alone. It's totally masculine yet gives her the message you have a kind and warm personality that you are ready to show her. As you smize at her keep your chin up and don't lose confidence. #3 Establish longer eye contact. After you've exchanged a few glances. It's time to take some more serious action and know it's not about approaching her just yet. It's all about creating some positive tension using eye contact. A 2005 study led by Dr. Malia Fox Mason a psychologist at Columbia University proved that we find people more attractive when they make eye contact and follow us with their gaze. So, why not take full advantage of what science has proven. Once you've caught her glance, again keep looking at her as if you're having a silent conversation. It sounds weird but it's not that hard if you've practiced. The most important thing is that you send her the right message. for another moment, it's a subtle way of telling her you find her so attractive that you literally can't take your eyes off her. As if they're stuck there again practice this technique in front of the mirror, you don't want to risk coming out awkward or creepy. If you feel like something's gone wrong and your connection has been interrupted on her side, don't panic! It's not the end yet, you see there are shy guys and there are also shy girls out there. She might just need a little more time to adjust. Besides that, if she suddenly looked away, she might be playing hard-to-get. In that case, just stay confident and show her you're still in it to win it. Once you've got her attention back, let her know you're about to approach her. Yes! you have to do it without saying a word with your mouth, say it with your eyes instead. Finally, it's time for the big scary part you've both feared and waited for, approach the girl. To make it easier for you, think of it this way, she invited you to get to know her and you're just accepting her invitation. She's the one who looked at you in the first place right! So, get up, don't slouch, keep your back straight, and your head up and approach the girl. Now, that you're standing next to her, it's time to say something. myself" Instead, go for "hey I don't think we've met before, my name is". topics you're gonna cover. Remember one thing girls love a guy who listens, respond to what she says, and not just one-liners like "oh that's cool" ask follow-up questions and just be yourself. human "is being treated with respect". Do you find it hard to approach people you don't know? Tell us in the comments.